The March 1 edition of Fortune Magazine has an article titled “Alan Greenspan Fights Back.” The link is found here. I found the article interesting for a variety of reasons. As the article mentions, rarely has Greenspan addressed his purported culpability in creating the housing bubble and its accompanying impact on the economy. Greenspan’s tenure at The Federal Reserve is most fascinating. One aspect of this is how his performance was perceived over time. Throughout most of his tenure he was effusively lauded (i.e. “The Maestro”) – but this widespread acclaim has been (severely) tarnished over the last decade. As the article indicates, Greenspan is preparing a 12,000-word article in his defense. I look forward to seeing this article and analyzing his argument. As far as Greenspan’s performance and actions are concerned, I do not believe there has been an accurate assessment yet provided. This entry was posted in Uncategorized and tagged Alan Greenspan on February 26, 2010 by Ted Kavadas. Up to this point, I have yet to mention “Keynes” or any derivative thereof. The reason for this is simple – I don’t believe that the efforts taken to stimulate the economy are reflective of the theories that Keynes espoused. Instead, they are a type of “bastardized” Keynesian Theory – used by various parties in an attempt to “legitimize” the tremendous amounts of money spent on various stimulus plans. I’ve been meaning to write a blog post about this and other related topics. I still intend to write a fuller post. However, what prompted me to write about this now is a very interesting article I ran across in Fortune Magazine. It is a February 5 interview with Allan Meltzer and can be found at this link. As Meltzer indicates in the interview, Keynesian Theory is not aligned with the stimulus actions we, as a nation, have undertaken. This entry was posted in Intervention and tagged Keynes, stimulus on February 25, 2010 by Ted Kavadas. I have written extensively about interventions, which includes stimulus spending. Stimulus spending and interventions are widely (and wildly) misunderstood. I think it is very important to have a full understanding of how the ARRA, a very large stimulus, is performing. As I wrote in a July 9 2009 blog post in which I discussed the ARRA, “Even if one were unabashedly pro-stimulus, one would find some serious faults with the $787 Billion stimulus plan, as enacted.” As such, it should be of little surprise that the ARRA has been, at best, such a poor performer when analyzed in a variety of manners. Here is a recent article from Alan Reynolds concerning the effectiveness of the ARRA. Although I don’t necessarily agree with some of his conclusions, he does present some interesting statistics and views with regard to how the ARRA has performed. This entry was posted in Intervention and tagged Intervention, stimulus on February 24, 2010 by Ted Kavadas. On October 16 I wrote a post titled “Tax Increases And Our Economic Situation.” That post can be found at this link. Some may wonder what tax increases I am referring to, as at least headline tax rates have yet to increase in many areas. Tax increases have been deferred for many reasons. Among these reasons is the negative political ramifications of raising taxes before the upcoming November elections. However, if we are to at least partially curtail our current deficit levels, an increase in taxes is likely certain. Everyone should know this, at least intuitively; and I believe there is widespread recognition of these impending tax increases. Thus, our current economic situation is such: economic weakness that is met with stimulus / deficit spending – that then leads to tax increases. These tax increases – during a time of economic weakness – will likely weigh (very) heavily against any lasting economic recovery. This situation may not be inherently problematical if the stimulus / deficit spending was indeed highly economically stimulative. However, if it is not (and there is little if any evidence that recent stimulus programs have been), a “vicious circle” may form – with large stimulus / deficit spending driving ever-higher taxes – with the net result a weaker – and more highly-indebted economy. This weaker economy in turn drives higher stimulus / deficit spending – and ever-higher taxes. There are a lot of complexities and other factors at work in this relationship; however, such an in-depth discussion would be too prohibitively lengthy and complex for a blog post. However, as one can envision, this “vicious circle” can become very pernicious on many fronts. This entry was posted in Intervention, Uncategorized and tagged additional stimulus, tax increases on February 23, 2010 by Ted Kavadas. Here is poll (in PDF format) on economic conditions that I believe is highly notable. It is from CNN and was conducted February 12-15, 2010. Of further note, when one looks at the trend of the responses, there hasn’t been much of an improvement from year-ago levels. Although this is only one survey, I think it is notable in that it seems to belie many other economic statistics that have been used to support the widely-held theory that we are in an economic recovery. In my opinion, this large dichotomy can not, and will not, last. This entry was posted in Uncategorized and tagged economic recovery on February 22, 2010 by Ted Kavadas. The February Wall Street Journal Economic Forecast Survey can be found at this link. There wasn’t much change in the survey results from last month. Also, as seen in the detail, there hasn’t been much change for many of the parameters for the last few months. As I have previously commented, I find it highly notable that there is such a “tight” consensus among the forecasters – especially for the major forecasting categories such as GDP and unemployment. This survey also asked respondents to rate the economic performance of Ben Bernanke, Treasury Secretary Geithner and President Obama. On a 1-100 scale, President Obama got an average score of 57, Treasury Secretary Geithner got an average score of 60, and Ben Bernanke got an average score of 78. I post various economic forecasts because I believe they should be carefully monitored. However, as regular readers of this blog are aware, I do not agree with the consensus estimates or much of the accompanying commentary. This entry was posted in Economic Forecasts and tagged Economic Forecasts on February 22, 2010 by Ted Kavadas. In the Wall Street Journal on Saturday, February 13 there was an editorial titled “High-Speed Spending.” This discussed the dubious financial dynamics of a long-proposed “high speed” Orlando-to-Tampa rail project. I also heard of a proposal to do a similar project between St. Louis and Chicago. I have lived in the Chicago area for most of my life and have never heard anyone expressing a desire to have faster transportation (or such a “high speed” rail option) between St. Louis and Chicago. Yet, in this case, as in the Orlando-to-Tampa case, the proposed “high-speed” rail project would cost billions of dollars. If we are looking to spend money on infrastructure, perhaps it would be wiser to spend on our existing infrastructure, which is literally crumbling. Estimates to fix our existing infrastructure range into the trillions of dollars. These estimated figures are rapidly growing. Examples of wasteful deficit spending are innumerable, unfortunately. In my opinion, we, as a nation, are not in a position to waste any money at this point. This entry was posted in Intervention, Uncategorized and tagged deficits, stimulus on February 19, 2010 by Ted Kavadas. On February 10th an editorial by Scott S. Powell appeared in Investor’s Business Daily titled “Greece’s Crisis: A Warning To Profligate U.S.?” The link can be found here. I am highlighting this editorial as it discusses many important issues, most of which I have previously mentioned on this blog. As well, it compares our current financial situation to that of Greece’s. This entry was posted in Uncategorized and tagged asset bubbles, deficits, national debt on February 18, 2010 by Ted Kavadas. Over the last few years, there has been an inverse correlation between price movements of the US Dollar and many asset classes. This inverse correlation appears to be strengthening over time. 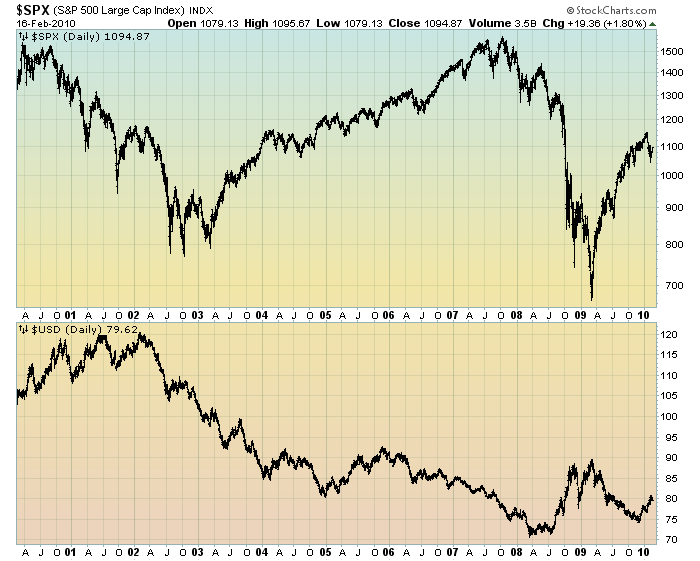 This inverse correlation can be seen in the chart below. For the sake of simplicity, I am only comparing the USD to the S&P500 – but as aforementioned this inverse correlation can be seen among a diverse group of assets. While this inverse correlation has been frequently commented upon in the media, there are two aspects of this relationship that I have not heard discussed. First, what is causing this inverse correlation? Second, shouldn’t the existence of this relationship cause some unease? The answer to both of these questions is likely complex. However, I do believe they are very important issues. This entry was posted in Investor and tagged assets, US Dollar on February 17, 2010 by Ted Kavadas. On Saturday The Wall Street Journal had an editorial titled “Escape from Taxation.” The link is here. In the editorial, it is mentioned that higher-income people are moving out of New Jersey as the tax rate is increased. In my article “America’s Trojan Horse” found at this link, I discussed the widely-held fallacy that debt and deficits are almost inconsequential because governments can always increase taxation to service and repay debt. What is happening in New Jersey is an important example of how this “increasing debt / increasing taxation” dynamic plays out in the “real world” – especially during times of prolonged economic stress and high indebtedness. The implications are very far-reaching with regard to the resolve of heightened levels of indebtedness. This entry was posted in Uncategorized and tagged New Jersey, state budget deficits, tax increases on February 16, 2010 by Ted Kavadas.